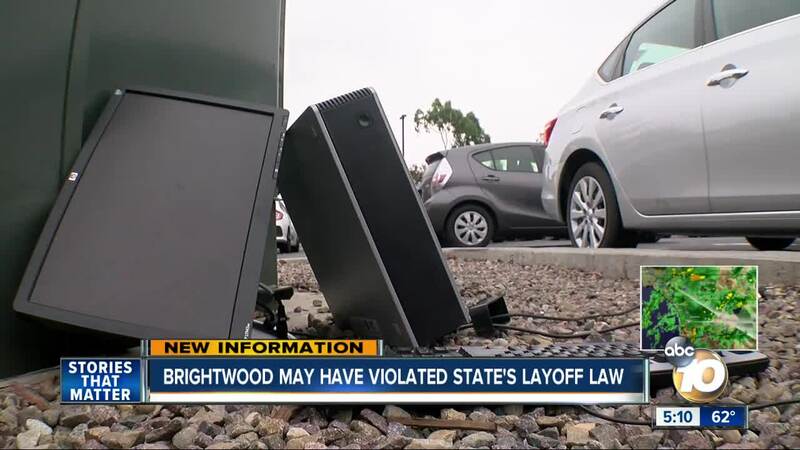 SAN DIEGO (KGTV) — Brightwood College stunned its students and workers with its abrupt shutdown Wednesday morning. But the for-profit college, with three locations in San Diego County, may have violated California law by not giving workers proper notice. The state’s WARN Act requires employers with at least 75 workers - which multiple employees say Brightwood had - at least 60 days notice (and pay) before a mass layoff. But Brightwood did not notify the workers or the state before announcing the shutdown. “I was at a clinical site with my group and I received a text message from my dean and she wanted me to pull my students from the floor,” said Hudson, a full-time clinical instructor. Brightwood’s parent company, Education Corporation of America, did not immediately return an email seeking comment. Employment attorney Dan Eaton said there are exemptions to the warn act, but under very specific financial conditions the state Department of Industrial Relations must approve. “On the face of it they would have to provide more documentation to show they are excused from the requirements,” said Eaton, of Seltzer Caplan McMahon Vitek. “If they are unable to do that, then there will presumably be consequences from not giving the 60 days notice." Those consequences include employee backpay, medical reimbursement, and a civil penalty of $500 a day. Brightwood said in a statement that that added requirements from the Department of Education, and a loss of accreditation from the Accrediting Council for Independent Colleges and Schools made it impossible to continue operations.